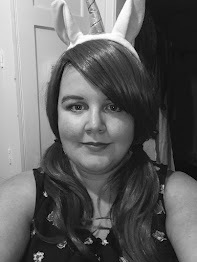 Of course there were a couple that appealed most to my natural interest, but having only seen one of the films in the list (Harry Potter) I have to confess to being a little bit anxious about writing about a film that I know little about. When an actor or actress takes the role of playing a person who really exists (ie not a fictional creation), it's easy for an audience to focus on the talents of the actor: The mannerisms. The voice. The attitude. But, so many of us forget the extensive amount of work that goes into creating the physical being that looks like the original person, that the actor is portraying. 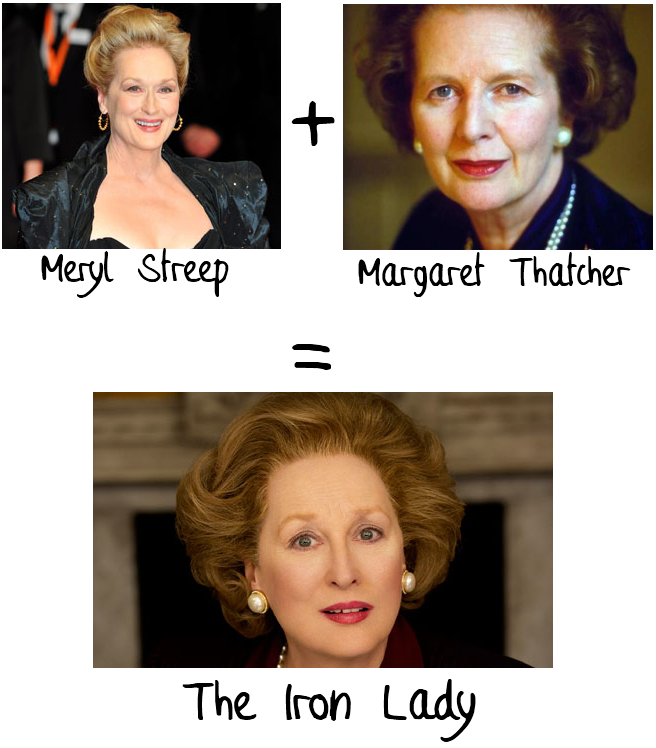 On the surface, Meryl Streep looks absolutely nothing like Margaret Thatcher. Even Thatcher in her younger years, doesn't match Streep's overall look. So, what about Streep has been changed for the role? The Hair is probably the most noticeable factor, as Streep is renowned for being blonde. However, Thatcher is known for being darker and having much shorter hair than the style that Streep is known to generally wear. Allegedly, Coulier considered creating a bald cap to copy the idea of an older woman's thinning hair, however he decided to pin the hair back instead. 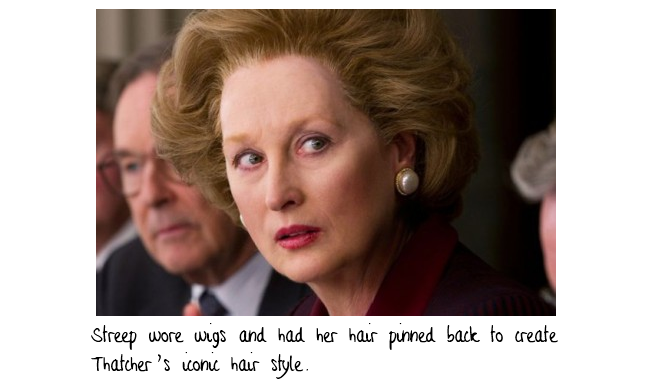 To create hair styles that were in keeping with Thatcher's was probably going to be difficult with the type of hair that Streep possesses, so the use of wigs isn't at all surprising. The Face. Throughout her career, Streep's look and beauty has been down to those cheekbones, however, Thatcher's cheekbones are of course entirely different, and so Streep was given false ones in order to soften her cheekbones and hence the overall look of her face. Streep also differs in appearance to Thatcher in the eyes. Thatcher is known for having hooded eyelids (like I also have), whilst Streep doesn't. However, the Make Up team apparently opted not to alter Streep's eyes. I'm not really sure why, but I can't help thinking that this was one of the first downfalls in Streep's Thatcher make over. I can't help feeling that this is one of several aspects of Streep that has been left more "attractive" than Thatcher really was/is. Even in the main image above of Streep in her make up and prosthetics, Streep looks much more fresh faced that Thatcher ever did. And in a way more "Hollywood". 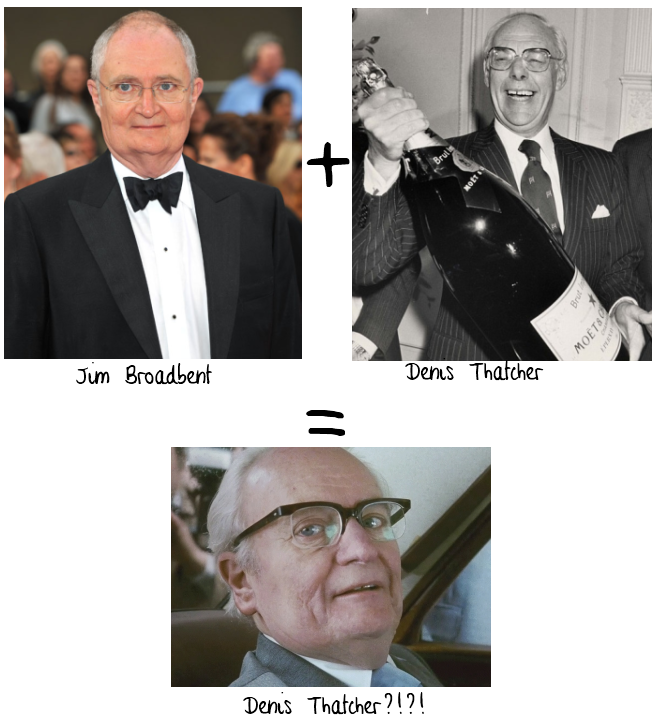 Whilst Broadbent's transformation is just as astounding as Streep's, and the make up department deserve all the credit and praise that they get, I don't personally think that Broadbent looks that much like Denis Thatcher. This is mainly because he has a much "broader" (no pun intended) face to Thatcher, and I just think that more could have been done to slim his face down. Overall: Of course the transformations weren't perfect, but did they really need to be? I'm not even going to pretend to have seen the film, or even any of the trailers for it, so I'm not going to judge the film on it's acting. For this post, I have focused solely on the aesthetics of both Streep and Broadbent. Have you seen The Iron Lady? Do you think is was a worthy winner of the Make Up and Hair Award? Or, do you think another film deserved it more? Information regarding Meryl Streep's transformation was taken from this article featured in The Daily Mail.